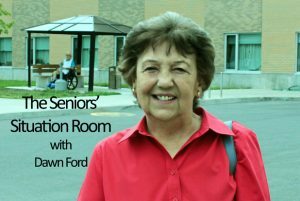 Seniors Situation Room by Dawn Ford – Father’s Day is June 17th! Sunday June 17th. is Father’s Day. Happy Father’s Day to all of you Dads out there and Grandpas. Ed Lauzon once again delighted the residents and friends of Beek Lindsay Seniors Residence with another wonderful concert. 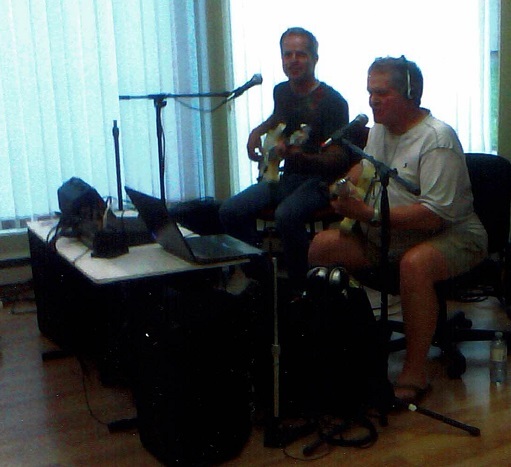 His son Ed Jr. joined his Dad in providing a two hour concert of familiar and loved songs. I had decided to not dance at this concert, to just sit back and enjoy the music but it didn’t take long before a lot of us were up dancing while some people sang along to well known songs like Elvis’s, “Can’t Help Falling in Love With You”, one of my favourites of The Drifter’s, “Under the Boardwalk”, Willy Nelson’s “Good Morning America” and “Brown Eyed Girl”. One of Ed Jr’s solos was “Daydreams about Night things”, Ronnie Millsap. “Achy Breaky Heart” got a lot of us up dancing as well, as did the old “Twist”. Ed and some of the dancers gave a demonstration of some basic line dancing steps which was fun. In the middle of all this Rock and Roll, Country Music and Pop, Ed sang “Amazing Grace”. After the hymn was finished there were a few moments of silence before the clapping began. It reminded me of when I was in the Accapella Choir at CCVS as a teenager. Our music director had said that when a song is over and there are moments of silence before the applause, it means that the music has touched the audience emotionally. That is what happened after Ed sang “Amazing Grace”. We were all touched by it. It was beautiful. Thanks so much Ed and Ed Jr. for taking the time to provide so much happiness and fun to the residents. Your concert was wonderful and very much appreciated by everyone. Happy Father’s Day to you both..
Ed’s music is on You Tube. Click on the link: “Crazy Ed’s Wonderful World of Song” to enjoy many of his favourite songs over the years of mostly “country” and “50’s and ’60’s rock and roll”. The song,” Achy Breaky Heart” brought back some memories for me. When I worked at Mount Carmel House Treatment Center in St. Raphael’s, Ontario, we had a Housekeeping staff member who loved music and dancing. When “Achy Breaky Heart” came out in the early ’90’s, we would find her here and there in the building singing it and doing a little dance. She even got some of the residents up doing a little dance also which was great fun for them. The song was released in 1992 by Billy Ray Cyrus. A belated Happy Birthday to a very special guy, my nephew Alex Herrington who celebrated his birthday on June 3rd. Alex is a wonderful man and very handsome. He laughs when I say he is handsome but he is just like his Dad Sonny – handsome. (Am I going to be in trouble! !…lol) and a very Happy Father’s Day also, Alex. 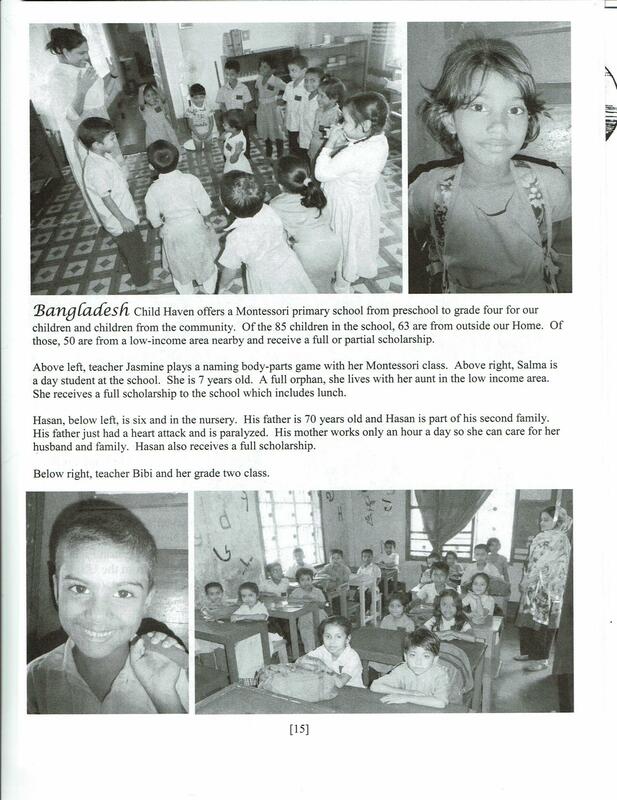 In this photo of the Child Haven International newsletter, are children in the Bangladesh home attending the Montessori primary school from preschool to grade 4. The article states that of the 85 children attending, 63 are from outside the home. Child Haven is providing these children with education and 50 of the 63 children are from a low income area and receive full or partial scholarship. Wonderful organization. Child Haven International has ten projects in four countries: Tibet in China, Nepal, Bangladesh and India. CH was founded by Dr. Nat Shah and Bonnie and Fred Cappuccino in 1985 to help orphaned and destitute children and women in need of health care, clothing, food, education and moral and emotional support. Remember the old days when we had ironing boards in a little alcove type closet and all you had to do was open the door and lay it down and presto…all set to iron. I had one in an older apartment building I lived in the late 1960’s. In the bottom of the little closet was room for the iron storage. It was so handy and out of the way when not in use. Haven’t seen one since. A friend of mine said there was one in her family kitchen when she was growing up. She said that they also had a step ladder with an ironing board down one side. All you had to do was bring the board up to top level and iron away!! 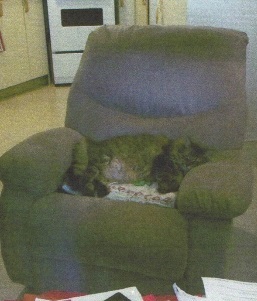 When I saw this photo I had to laugh because, when Tiger was visiting a neighbour one day while I was away, he apparently headed right for the friend’s lazy boy chair and promptly had a nap. And why not , eh? Comfortable and cozy!! What a cat!! What a big big baby!! He practically went into shock. He couldn’t sleep all night and got up at the crack of dawn to go to his office. He was nervous all day watching the clock. He figured if he got by until midnight he would be okay. He felt safe at the office, so instead of going home at the end of the day he stayed there, drinking coffee, looking at his watch and jumping at every sound.